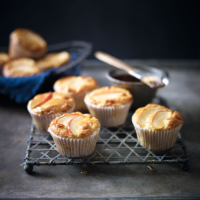 The classic autumn flavour combination of crisp apples with chewy fudge is the inspiration for these easy muffins. 1. Preheat the oven to 180°C, gas mark 4 and line a 12-hole muffin tin with paper muffin cases. Place the flour, baking powder and fudge chunks in a medium bowl and stir until well combined. 2. Thinly slice one apple half and cut the remainder into small dice. Stir the dice into the flour mixture and set aside the slices for the top. 3. In a separate bowl, beat together the egg and sugar. Whisk in the melted butter until just combined, then whisk in the soured cream. 4. Stir the wet mixture into the dry ingredients, folding with a silicone spatula or spoon until the batter just comes together. 5. Spoon the mixture into the paper cases, topping each one with a slice or two of apple. Bake for 20–25 minutes, until a skewer inserted into the centre of a muffin comes out clean. Brush with the honey or syrup then leave on a wire rack to cool. be stored in an airtight container for up to three days.